I’ve run into this problem a couple of times in the past 2 years and it takes me too long to find the resolution, so I’m posting it here. Thank you so much! I have been having this problem at work and we had uninstalled everything and could not get this uninstalled and to go away! Now it is gone! I have tried this, but unfortunately it did not work. I have deleted all of the files and rebooted (many times – I did this a couple of weeks ago) and I still get the error message every morning when I restart my computer. Do you have any other ideas? I found that this “fix” worked once but then returned. 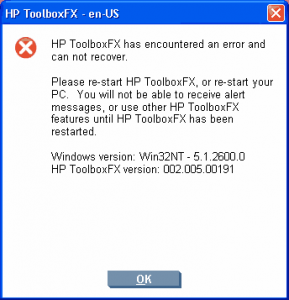 It has been stated that ToolboxFX is not valid for Windows 7 anyway. The fix I finally found was to delete every reference to ToolboxFX, both on the C-drive and the registry. There are dozens of references to it in the registry so it takes some time to delete them all, but it does no harm to the registry so long as you are careful. If anyone does not know how to reference the registry, click on “Start” and type in “regedit” (without the quote marks). Spot on! Thanks for sharing. The referenced folder location does not exist on my laptop. I used the search function as well as visual observation but C:\ProgramData\Hewlett-Packard\ToolboxFX\Settings does not exist. Executed this fix in Windows 10 and so far it works! Have been looking on the internet for solutions, but could not find anything that looked suitable apart from completely removing all HP software and left over traces and reinstalling. I am amazed that the HP web site or any HP support forums could not come up with this simple fix! Although this is an old post I am very happy to have stumbled across it. Thank you! I am having somewhat a similar problem. Got a toolboxfx message…I did as it prompted and restarted my pc. That seems to have deleted something because before I could scan and now I cannot. I followed your directions above but under Program data, the only folder was for images and that seems to be empty. Then clicked on Program files and found HP there. When I click on folder “HP” a number of folders are there including toolbox. Click on toolbox and again there are a number of folders. Sorry to beg but I have no clue how to fix this. Both my pc and printer/scanner are HP. Thank you so much for any assistance you can provide. OMG I just spent 2 hours uninstalling and reinstalling drivers to try and fix this. I was ready to give up and your simple fix did the trick. THANK YOU!!!! !